We in union place our trust in her heavenly comfort and her heavenly consolation and we very especially remember her, especially in this day of celebration. Heavenly Mother Mary, lovely flower that embodies the perfume of the Love and the consolation of the living God. The sun is high in the sky surrounded by its beautiful colors, when our feeling in the form of thought, caresses the skin of your naive feet. Beautiful Mary, preserve our heart and our soul, affect with your divine hands our desires, our joys and our sorrows by transforming them into a single melody. Protect us from the evil and its temptations and let us be the Temple of Light and Wisdom, according to the Holy wanting to who is our Teacher. Holy Mary, our Mother, visit in every thought and every vigil presenting us in front of the divine Father, operating, being fair and peaceful for the holy program that we serve and we want. Spread your friendly comfort over our steps and our actions, so that they always reflect in the unique and more great truth of all times. Eugenio loved to remember her in this special day. Miriam, friendly Mother, delightful heavenly love, progenitor of Him who was, is and will be Master of Life and Truth. the rosebushes flourished. 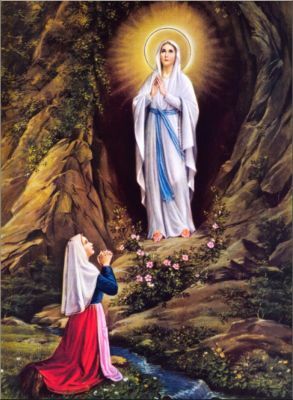 In our hearts flowers your heavenly love, our blessed Mother.